The British Red Cross ensures that first aid learning is available to all communities in the UK, so that individuals can respond to large and small scale incidents willingly, with confidence and skill. As a trainer for the British Red Cross, that is what I hope I can help members of the U3A to do. I run an Emergency Life Support Course (four hours - two, two hour sessions) whenever I have between 6 and 8 members willing to train at the same time. The course covers key life-saving skills, major illnesses and conditions, and bleeding. 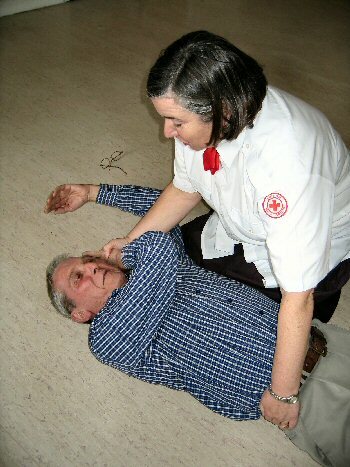 Recovery Position, Stroke and Heart Attack. Emergency Life Support is an optional addition to the Save a Life course and adds Burns, Bleeding and Fractures.